YouthBuild students and Kartav Patel, who manages Southwest Solutions' YouthBuild program, at the vacant home in the Newberry Project area that YouthBuild students are helping to rehab and which will be offered for sale in the early summer. Students in our YouthBuild program get hands-on training to help them build careers in the construction trades. Part of the training involves renovating vacant houses under the guidance of experienced instructors. The houses are part of our Newberry Project. This project area is in the Chadsey-Condon neighborhood. 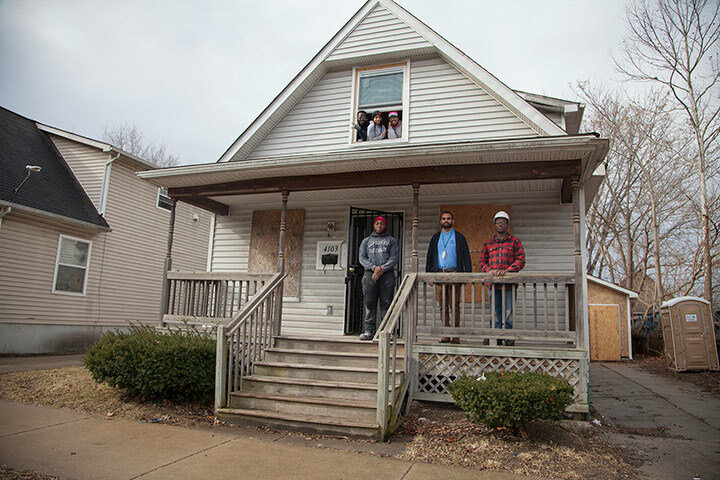 Southwest Solutions is rehabbing 60 single-family houses that were once low-income rental properties and making them available for affordable homeownership for low to moderate income families. This week, the YouthBuild students are helping to paint the inside of one of the houses, which is expected to be offered for sale in the early summer. YouthBuild is available to young people 16-24 years old who have an interest in the building trades and who live in Detroit, Highland Park or Hamtramck. It is a free, 26-week program. Students earn certifications in OSHA training, first aid, customer service and Work Keys, while receiving a stipend. They can also earn their GED. To sign up or learn more, contact Kartav at 313youthbuild@gmail.com or 313-733-1173. See the photo essay on our Facebook page.